Archaeologists have discovered a 4,300-year-old tomb in the shadow of the Saqqara Step pyramid, 22 miles south of Cairo. A 4,300-year-old pyramid has been unearthed in Saqqara, the sprawling necropolis and burial site of the rulers of ancient Memphis, Egypt's chief archaeologist announced today. The pyramid is said to belong to Queen Sesheshet, the mother of King Teti who ruled from 2323 to 2291 B.C. and was the founder of the 6th Dynasty of Egypt's Old Kingdom. "The only queen whose pyramid is missing is Sesheshet, which is why I am sure it belonged to her," Hawass told Reuters. "This will enrich our knowledge about the Old Kingdom." 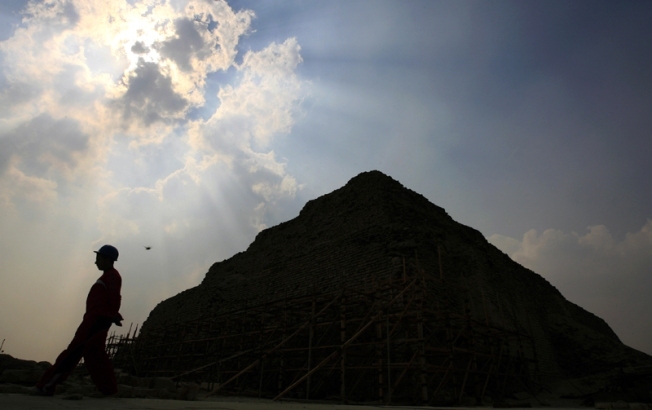 Egypt's antiquities chief Zahi Hawass made the announcement at the site in Saqqara, about 12 miles south of Cairo. Hawass' team has been excavating the site for two years. He says the discovery was only made two months ago when it became clear that the 16-foot-tall structure uncovered from the sand was a pyramid.